Gameboy Development Forum / Sheep it up! - my first Gameboy game! » Sheep it up! - my first Gameboy game! Sheep it up! - my first Gameboy game! Like many others members of this forum, I've participated in the "BitBitJam" compo, an event where you had to create a new game for a retro device. 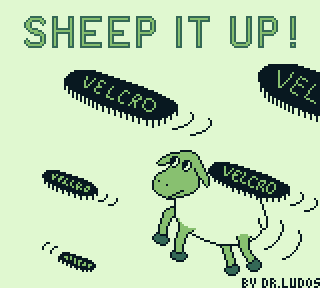 I took this opportunity to create my first Game Boy game: "Sheep it up!" It's a simple one-button game where a sheep has to climb up by jumping and hanging to flying velcro straps. The concept is simple, but the game rapidly gets quite challenging . My personal best is 136, who can make a higher score? I hope you'll enjoy the game! Re: Sheep it up! - my first Gameboy game! Very nice work, congrats! Hope to see more from you soon!